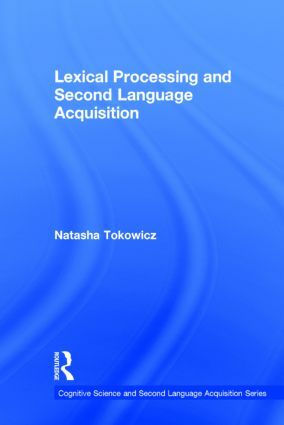 Lexical Processing and Second Language Acquisition provides a comprehensive overview of research on second language lexical processing, integrating converging research and perspectives from Cognitive Science and Second Language Acquisition. The book begins by introducing the dominant issues addressed by research in the field in cognitive science and discussing the relevant models in the literature. It later moves toward exploring the different factors that impact second language lexical processing as well as cognitive neuroscientific approaches to the study of the issues discussed throughout the book. A concluding chapter offers a global summary of the key issues and research strands, in addition to directions for future research, with a list of recommended readings providing students and researchers with avenues for further study. Natasha Tokowicz is Associate Professor of Psychology and Linguistics and Research Scientist at the Learning Research and Development Center at the University of Pittsburgh.